All employees who worked underground in the Kolar Gold Mines, were fully aware of the dangers of their occupation. They were prepared for any eventuality. There were several instances of tragic and fatal accidents inside the mines that left many workers physically handicapped and incapacitated. Several times, there was loss of lives due to the Rock Bursts or Air Blasts. The Rock Bursts during the 1920s and 30s and the massive Rock Burst in 1952, claimed many lives as quite a few miners were buried alive. Besides, the Rock Bursts and Air Blasts, there were also many fire accidents in the mines. The smell of smoke or eucalyptus oil was a direct warning that there was a fire somewhere in the mine. The workers knew that their first priority was to immediately inform the Surface Banksman of the Shaft by telephone or other means about the fire and try to put it out themselves with the firefighting equipment underground. The miners had to then evacuate the place and come up to safety immediately. As per procedure in the event of a fire breaking out underground, , 2 large bottles of Eucalyptus oil were immediately poured into the two air mains, and also sprinkled into the downcast air by the Surface Banksman. The strong smell of eucalyptus would quickly spread through all the tunnels underground thereby warning all the miners working in other tunnels to quickly rush to higher safety levels, from where they could come up to the surface safely. Once the fire warning was announced no one was allowed to enter the mine except the Fire Inspectors and the Rescue team. with their fire fighting apparatus to subdue the fire.. These men wore special masks known as Burrell Masks and other fire resistant gear to protect them from the flames. 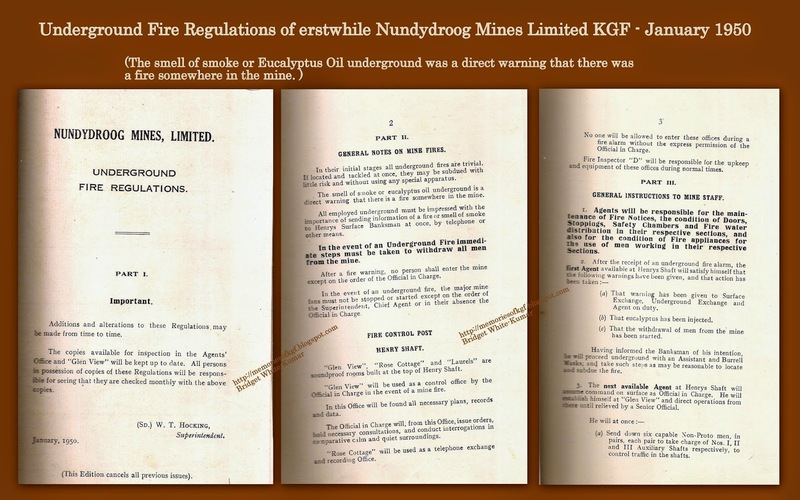 I’m sharing below the first 3 pages of the Nundydroog Mines Limited, Underground Fire regulations (January 1950) that was my dad’s copy when he was an Agent in Henry Shaft, Nundydroog Mine.